April 5, 2016 by Vinay Leo R.
The first time I read Harry Potter and the Sorcerer’s Stone (or Philosopher’s Stone), I read and re-read it a few times before giving it back to the library. I was so engrossed in the book that some scenes just came to life and stayed in my mind long after the read. It was nice to see those scenes in the movie version of the book, and quite a few were done justice, I feel. The way Dumbledore comes in the night to leave Harry at the Dursleys and Hagrid’s motorcycle were just two of the scenes that left an impact on me. But it’s a credit to the author that what I wanted to know as I read the book then, she brought to the table sooner rather than later. The brick he had touched quivered — it wriggled — in the middle, a small hole appeared — it grew wider and wider — a second later they were facing an archway large enough even for Hagrid, an archway onto a cobbled street that twisted and turned out of sight. Diagon Alley, with its cobblestoned paths and mix of restaurants, shops and other places, was one that I had pictured very clearly in my mind. I walked under the archway with Harry as he entered it, imagining the same excitement. I saw the sunlight on the cauldrons in the nearest shop, imagined the apothecary and heard the hoot of the owls from Eeylops Owl Emporium. I felt the excitement of the boys who were looking at the broomsticks. And was amazed when with Harry, I entered the wizarding bank. I imagined I was standing in the room where Malfoy and Harry got fitted for robes at Madam Malkin’s. Diagon Alley is one of the places where magic is the cynosure. It isn’t known how the world is hidden from the muggles. Perhaps my favorite shop in the alley initially was Ollivander’s. The book had the memory of Harry getting his first wand. It’s the only time we see or enter the shop in the whole series, so the memory is special. I also wanted to see what Quality Quidditch Supplies looked like, but we’re only given a fleeting view of it in the movies. Magical Menagerie, from where Hermione buys her cat Crookshanks, is another shop that I could imagine nicely; imagining the show-off mice was particularly enjoyable. In the sixth book, Diagon Alley gets a great addition too – Weasley’s Wizarding Wheezes, which became my favorite shop. So many shops I loved at Diagon Alley, but there is magic everywhere, or so I feel. Sixteen years after I first read the book and visited Diagon Alley for the first time, I look back at it and wonder, “Isn’t there something in real life that comes somewhat close to that?” Granted, I cannot recreate Diagon Alley with its magic in my city, but there is an area that comes really close. It’s one that I haunt a lot, and feel the time fly by when I visit. Some of my fellow Potterheads who have been here might understand the comparison. Church Street and Brigade Road together offer me that magic I have in my life. Blossom Book Store is my Flourish and Blotts of late; there are food haunts that feel like Florean Fortescue’s Ice Cream Parlor; there’s even a bank, and the street has lots of peddlers too. Diagon Alley even has a proper second hand bookshop, of which this area has many. For a bookworm and a foodie, that’s magic, don’t you think? But reality always takes a break when I read Harry Potter. So as I re-read it now, only the magic of Diagon Alley is recreated in my mind. My city, and the world around me fades. So if you are a Potterhead and were to come with me as I step under the archway again to enter Diagon Alley, which would be the first shop you’d visit? Diagon Alley – for many it is not so huge, but for me it is the magic portal that took me (and yeah, Harry) to the world of wizards. I still like the word play with diagonally and nocturnally. JKR never fails to amaze me. Though now that I am reading again and again, I want to visit the world of Harry Potter sets, at least. Yeah. It was an interesting play of words, for sure. 🙂 Glad you liked the post, Dhivya. You are literally tempting me to revisit the world of harry potter! I loved this place! So go ahead and revisit it, Nibha. 🙂 What’s stopping you from loving it again? Loved the word play by the author. Interesting D that is! Diagon Alley! That’s the whole world of magic in an alley. My favourite shop is the book store. Though itv is only shown once in the movies during a book launch. …that’s my fav. Yep. Flourish and Blotts is one of my favorite shops too, though I’d love to go to the ice-cream parlor. 🙂 Thanks, Reshmy. Diagon Alley. The street of my dreams. A street full of wonders for Muggels as we are 🙂 a brilliant choice for the letter D.
Yes. 🙂 A street of dreams, I agree. 😀 Thank you, Claudia. I’ve read each book more than ten times too, Cassie, and still enjoy re-reading them. 😀 Diagon Alley is absolutely the spotlight of the books, I feel. Glad you liked reading. Diagon Alley reminded me of the small gullies of old Indian cities of course without the magical bits. I completely loved Rowling’s play of words. She’s amazingly smart with her names. My favourite shop would be Ollivanders just like you – I think the wands are the most magical of all things – that’s where it all comes from, isn’t it? And I’d like to see which one matches with my personality. Hehe! 🙂 The books have so many memories for me, that I felt it was good to take up this theme for the A to Z. 😀 Thank you, Darshith. When I first saw Diagon Alley I was amazed… it was exactly how they mentioned in the book. Weasley’s shop is probably the best shop in the alley. 🙂 Yeah. Ollivander’s and WWW. 😀 Two of my favorite shops, Raji. Thank you. Would q be quidditch … will have to wait and see. I debated on Dumbledore at first, then decided on Diagon Alley. 🙂 Q is still a long way away, and I’ve not decided on it yet. 😀 It could be, of course. I’ll have to wait and see too. Thanks, Jayanthi. I guess my son would love this place, a big potterhead that he is! Diagon Alley.., I remember the awe and the excitement Harry had when he went shopping here. I must re-read this series soon! Hands down it’s Flourish and Blotts. Btw which is the second hand bookshop you have mentioned? I can’t recall one in Diagon Alley. And you are right, it is the dream destination only after Hogwarts, of course. 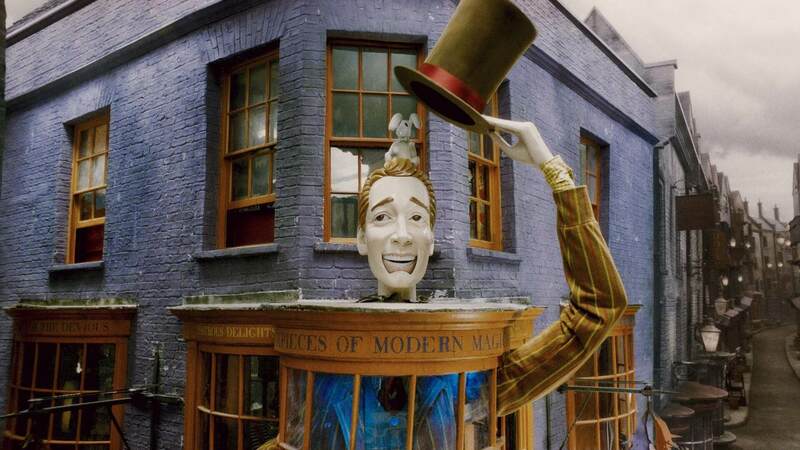 And of course, Weasley Wizards Wheezes is shop I have to visit every time I go to Diagon Alley! 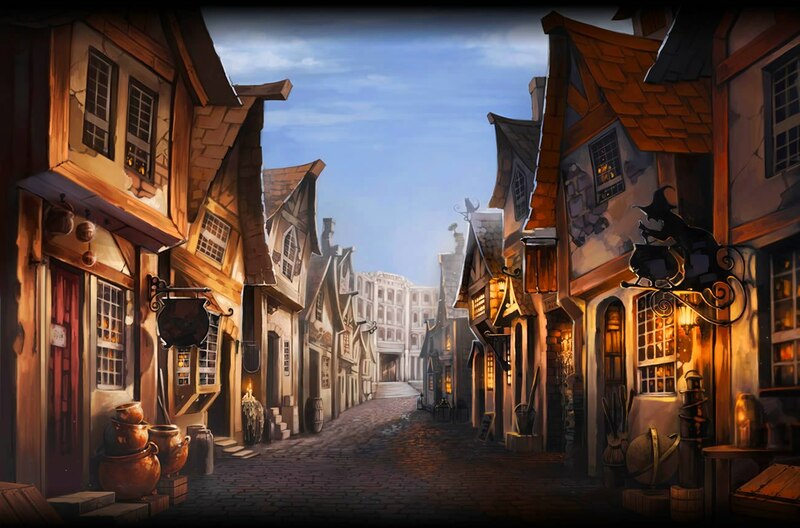 Did you know that Diagon Alley is a play on the word – diagonally? And Knockturn Alley actually was derived from nocturnally? Yes. I knew. 🙂 I had read about it, and also have many Potterhead friends who discuss things like that, Mithila. I have read your last year’s D. 🙂 It’s fabulous too. ANd yeah, i would go to Ollivanders first! I always wanted a wand! And how I wish I knew which wand would be mine! Oh I so want to start re-reading HP! Do 🙂 It’s fun any time, Ishi. Thank you. 🙂 Glad you liked it, Mithe.